Performance sailing implies making the boat perform as well as it can. 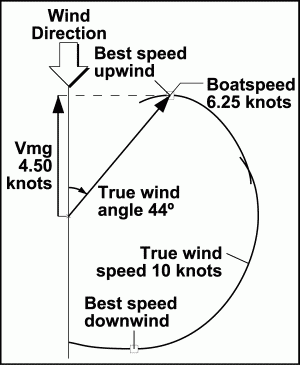 For sailboats this does not necessarily mean going fast, particularly upwind. There is no magic indicator that you are going upwind at the right angle – or speed for that matter. Sailing polars provide that important indicator. This is why “polars” have become an indispensable tool for all serious racers. No America’s Cup yacht puts to sea without an entire staff devoted to the care and feeding of its polars. On the grand prix circuit, everybody knows that you can’t go racing without one. So, what the heck is a polar? A “Polar” is a description of how fast a boat should sail at a given wind speed and angle. Plotting magnitude (i.e. boatspeed) at its associated angle (i.e. true wind angle) results in what math geeks call a “polar plot”, which is where the name comes from. The advantage of this kind of plot is that it graphically solves the equation for Vmg or speed made good. The most important data available from a polar is Target Speed, the boatspeed at maximum Vmg (the point of optimum up and downwind performance). For example, this polar tells you that in 10 knots, your boat should sail upwind at 44º true wind angle and 4.17 knots (your target speed for 10 knots). Sailing either faster or slower than your targets will hurt your upwind performance. Learn why you shouldn’t try making your own.